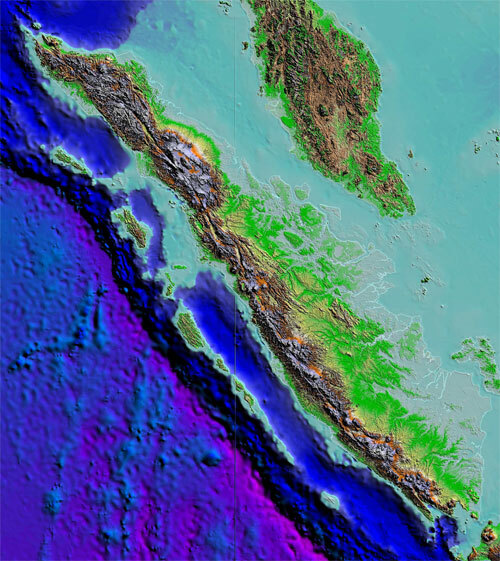 The Java trench is the result of the subduction zone caused by the Indo-Australian plate and the Eurasian plate. As this process of subduction occurs, massive amount of energy is stored and released resulting in very active and powerful seismic activity; One of the most powerful on Earth. The plate itself moves at a rate of 70mm per year. This chart shows the past earthquakes magnitude 7+ in the area, from 1975-2002. 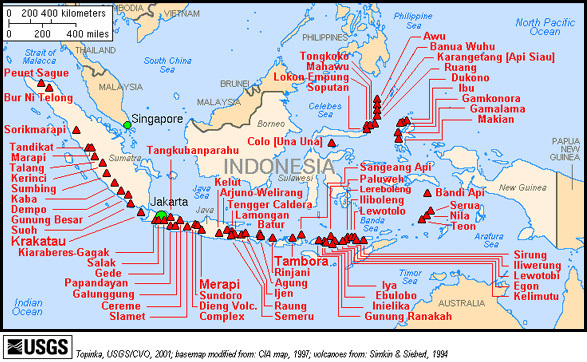 Many of the worlds most active Volcanoes are located in the area of Indonesia, around the Java Trench. Only those active since 1900 are shown in the map above. All of these Volcanoes occur as a result of the plate tectonics in the region. At ocean trenches, sea-floor sediments may either be scraped off the subducting plate, or accompany it into the mantle. At the Java trench, some of the subducted sediment may be recycled to the arc crust by magmatism due to volcanic activity. 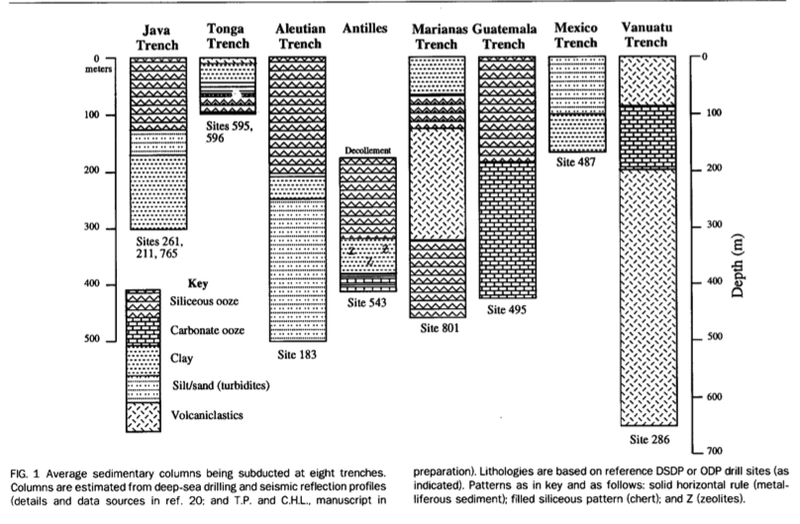 At the Java trench, the sediment generally goes from being siliceous ooze down until about 120 meters and then changes to silt/sand. At about 150 meters down it then changes to clay. Bathymetry is the study of ocean depth and it's features. One would think that the Java trench would just simply be a trench in the ocean floor, with two plates converging at the site. But a bathymetric model shows so much more. These sonar images of the ocean crust show a pattern of normal faults typical of outer wall of trenches. This related to the bending of the oceanic lithosphere into the subduction zone. Another feature seen by the Java trench are a number of sub-circular seamounts. Isolated “ponds” of flat-lying sedmidents occur in the trench axis. Where subducting seamounts are colliding with the wedge, large crescentic areas of very high backscattering correlate with re=entrants in the deformation front and large indentations in the wedge. 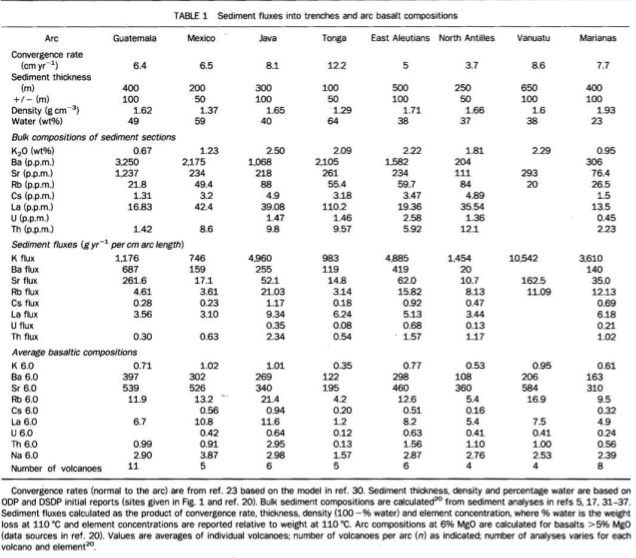 All sediment ponds in the trench axis occur in close association with collision scars, which suggest localised erosion.